Many homes and properties were wiped out by the Carlton Complex Fires in the Methow Valley in August 2014. Part of Pateros, Washington, was leveled by the fires of 2014. Scene from the Carlton Complex Fire aftermath. Pateros, Washington, from August 2014. The damage left by fires in the Methow Valley, August 2014. This week, the majestic Columbia River Gorge experienced an unprecedented fire that spread to more than 40,000 acres in less than five days. Residents and experts in this region were stunned by the still-unfolding disaster in what should be a fire resistant and lush region. The blaze was reportedly intentionally ignited by some teens on Saturday, Sept. 2, 2017, when temperatures were in the upper 90s. The group reportedly threw fireworks into the Eagle River Trail area, setting off a blaze that literally exploded in 48 hours, moving more than 13 miles and shutting down Interstate 84, a major transportation corridor, and threatening the primary drinking water source (Bull Run Reservoir) for more than 1 million people in the Portland area. The blaze is one of many in the region. Nearly 170,000 acres are ablaze at the Chetco Bar Fire, near Brookings, Oregon. Fires have scorched more than a million acres in Montana. Many experts are pointing to climate change and drying conditions as the main driver for the now frightening new normal. I have not had a chance to observe the wrath of the fire near my Portland home, because it is still an active conflagration, and the firefighters need to keep gawkers out. I will go in once it is safe. In light of what has happened this summer, I decide to dig up some pictures I took of the devastating Carlton Complex Firs in the Methow Valley area, in Washington state, in 2014. Seeing what fire can do to communities and landscapes is a sobering experience. I expect the worse is still yet to come, if that is even possible. I am a huge fan of the herding breeds, including the Texas heeler. Ever since I traveled to Omak, Washington, in 2012 and met a couple of amazing Texas heelers adored by their owner, I have been smitten by this breed. Herding dogs just have that certain special something. Hey good boy, you are looking might fine. Click on the picture to see a larger photo on a separate picture page. I really like pow-wows. They are lively, loud, physical, colorful, cultural, competitive, creative, and welcoming. One of my favorite activities in Seattle, when I lived there, was to visit Discovery Park for the annual Seafair Seattle Pow-Wow. The event fell on hard times recently, and has been cancelled, but it looks like funding was secured once more and it was held again, most recently in 2015. These shots all date from July 2013. All but one are of the male elders. What I noticed was a lot of intensity among the younger male dancers, and more energy conserving movements of the older, more veteran contestants. The most athletic did not win; it was the one who was in a space of personal expression, feeling the drum, and how that moved him. Contestants who participated came from across the Northwest region and Canada, and tribes from the Spokane, to the Colvilles, to the Warm Springs, to the Umatilla, and more, were represented. Everyone I saw appeared to love it. The place was packed and everyone was taking pictures. During a recent trip to one of my favorite cities in the United States, Spokane, I toured lots of neighborhoods. I was struck by the degree of poverty I did not recall seeing before. There are pockets of despair in any city in the United States, but Spokane surprised me because of how close some of these neighborhoods with high numbers of foreclosures were to downtown. The number of foreclosed properties is reportedly higher in Spokane than either Washington State or the United States, according the company Realtytrac.com. January 2016 alone saw 200 foreclosed properties in the city of 484,000 residents. As of 2014, the U.S. Census reports that more than 15 percent of all residents in the city alone lived below the poverty line. Click on each photo to see a larger picture on a separate picture page. The Community Trail in the Methow Valley, in Washington State, is one of the best skate ski trails in the United States, outside of Alaska. Photo taken in February 2013. Practice jump at the Omak Stampede, August 2013. Every modern motorcyle and extreme sports daredevil since the 1960s and 1970s stands in the long shadow of stunt rider Evel Knievel. The Butte, Montana, native and international showman built a legacy of thrilling audiences with death-defying leaps on his motorcyle over long distances. From the grisly televised crash at Caesar’s Palace in December 1967 to jumping 15 buses in Wembley Stadium in London in May 1975, Knievel conquered the public’s imagination. He had spectacular failures and reportedly broke more than 400 bones in his battered body over his long years as a showman extraordinaire and one-of-a-kind daredevil. 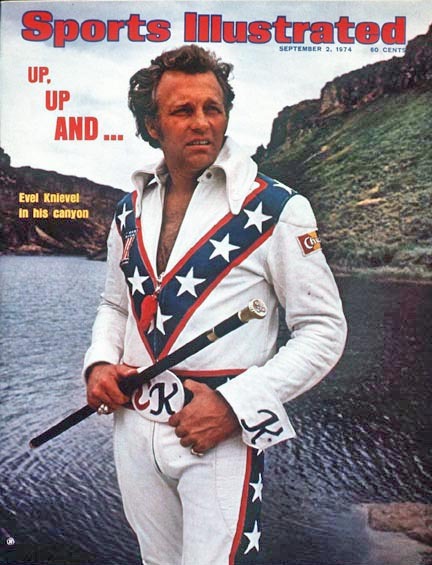 The Sports Illustrated cover shows Evel Knievel in his purest form, decked out in his all-American jump suit (great photo). Knievel completely invented himself, his persona, and his brand of entertainment from the ground up, with his imagination knowing no boundaries. His first recorded jump, according to the new documentary on his life called Being Evel, was over two cougars and a box of rattle snakes in Moses Lake, Washington, and he crashed open the box of snakes who got away. He then built up his reputation the hard way, show after show, and also crash after crash. His greatest media stunt, and failure too, was attempting to jump in a specialized vehicle over the Snake River Canyon on Sept. 8, 1974, with him crashing yet again in the canyon floor. But he got back up and kept at it. As a kid, I likely fell under the Kneivel spell, and saw him many times on TV, on lunch boxes, and on tabloid newspaper covers. He made more than half a dozen appearances on ABC’s Wide World of Sports in the 1970s, when I was growing up. He personified a type of fearless recklessness that excites nearly every young boy, and inspires a few to try such feats later in life. The current climate of Red Bull fueled stunts, jumping from outer space to leaping from cliff faces in wing suits, owes it all to him. Knievel proved you can become a legend if you are willing to put it all on the line and entertain the masses while doing it. Knievel died in 2007 at 69 years of age, a badass to the end, being totally himself. This is how parts of Pateros, Washington, looked after a fire destroyed parts of the city in 2014. More fires are burning in this area again this summer, and the damage is extensive. Following the hottest July ever in human recorded history on planet earth, the American west is having the greatest outbreak of wildfires since the great fires of 1910, which ravaged Montana, Idaho, and Washington state. Fires are burning widely across my home state of Oregon, Washington, California, British Columbia, and Alaska. Three firefighters were killed on Aug. 19, fighting a blaze in the Methow Valley near Twisp–an area hammered by wildfires in 2014. There is major change taking place. This will involve how we plan for fire, build in fire zones, speculate for fast profits in pretty Western scenery (if you can afford that game), and consider what is safe. Maybe the lessons will be forgotten. People, particularly wealthy people, will still want to live near the mountains and wild places where fires naturally occur, but with global warming patterns due to climate change, the ecosystem will be transformed more and more by big burns. We as a country cannot afford to purely protect all of the property here, particularly when the sacrifice is lost firefighters’ lives. Will it one day be left just to burn? I took this picture about a week after fires ravaged the town of Pateros, in central Washington, again at the center of Washington’s complex of fires. Click on each the photo to see a larger picture on a separate picture page. The next generation of future American men in uniform prepare to carry in the flags of the U.S. Armed Services. The faces of the young boys who likely will be called to serve once they join the U.S. Armed Forces. The group held flags of American states and territories. Memorial Day, a day that was first dedicated to the fallen Civil War dead as Decoration Day in 1868, morphed over the decades to honoring all fallen soldiers after World War I. It has been a while since I attended a Memorial Day event (I have done many Veterans Day activities). So I went to beautiful and the historic Fort Vancouver National Historic Site, where hundreds of veterans, their families, and supporters gathered to pay tribute to fallen service personnel on May 25. I am not a veteran. I do have veterans in my family history. And I know enough about history to know the world is a dangerous place without someone protecting the welfare of folks back home. That would be people like me. 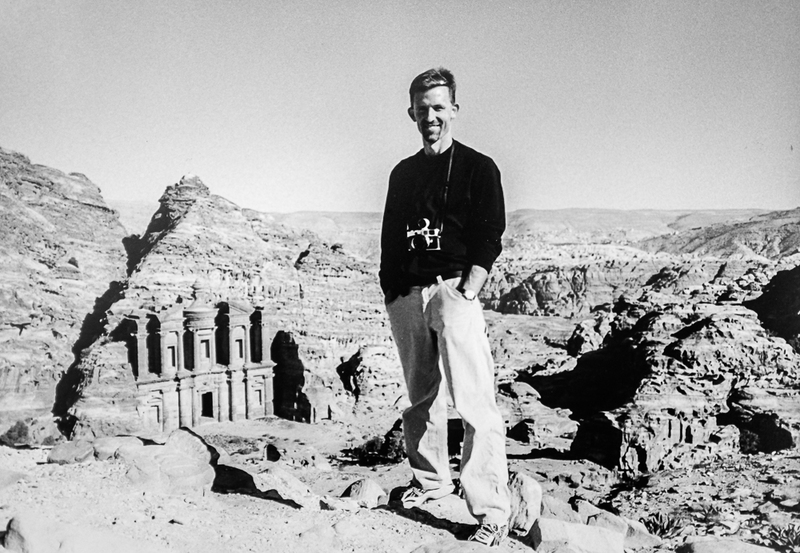 I have visited too many battlefields on the planet to not take a long view of what history bitterly teaches us all. So I think it is important to honor the fallen, and also to honor the individual stories. So I will always honor the ritual, the memories, and emotions. The messaging at such events, by the dignitaries chosen to make meaning of an event, is where issues can arise for me. So on that note, I will call it good and wish the folks well who were close to those who sacrificed and, as Abraham Lincoln said, gave their full measure of devotion for the country.